How to Backup and Restore apps using the " Titanium Backup " App. NOTE - Your phone must be rooted to use this app. Download the app from the play store. Link given below. ## Before using the app go to settings then Developer options and select USB debugging mode "on" ( if there is no Developer options in your ROM , then go to About phone in settings and tap “Build Number” atleast 7 times and go back you will find Developer options in settings ) and also select the " Unknown sources " by going to the security in settings. After installing the app , open it and Grant permission to it. This app will store the backup of your apps in the phone's internal memory for the ROMs in which the internal memory ( i.e of 12.47 gb ) is default memory ( For Ex. Spice Stock ROM ). And in the ROMs that are having the Sd card as main memory ( For Ex. 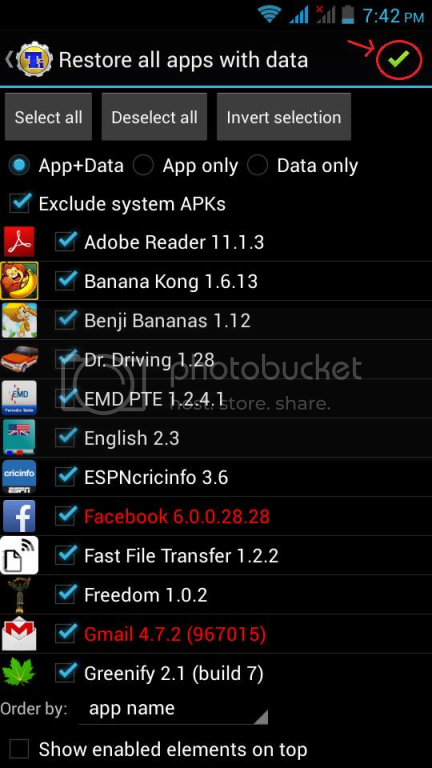 Lewa , Note 3 , Xperia ROM ) , the backup will be stored in the sd card. Now after Granting permission, you will see like this. Select the portion that is marked in the red colour circle in the photo. Then you will see like this , Now if you want to do the backup of users apps ( means the apps that you downloaded ) then select the portion that is marked in the red colour circle in the photo. And if you want to do the backup of the system apps then select the "RUN" having written Backup all system data. 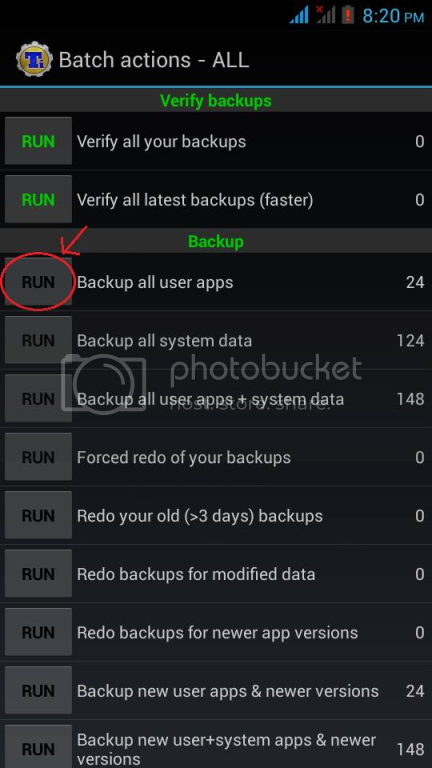 You can also take the backup of both by selecting the " RUN " having written Backup all users apps+system data. But I will recommend you to take the backup separately. Important thing keep patience while it is backing up your apps because it take long time also that depends on the no. of apps you are backing up. Then after selecting the " RUN " you want and you will see like this. You will find your apps list. Un-check the app that you didn't want to be backup. After selecting the apps you want to backup , select the portion that is in the red marked circle in the photo . Now when the backing up of your apps complete , you will see a folder named "TItanium Backup " in the internal memory for the ROMs in which the internal memory ( i.e of 12.47 gb ) is default memory ( For Ex. Spice Stock ROM ). And in the ROMs that are having the Sd card as main memory ( For Ex. Note 3 , Xperia ROM ) , you will find the " Titanium Backup " in your sd card. Now Important thing , you can copy this folder to the computer for future use. Do not rename the Folder because if you will rename the folder i.e " Titanium backup " , the titanium backup app will not be able to recognize it. 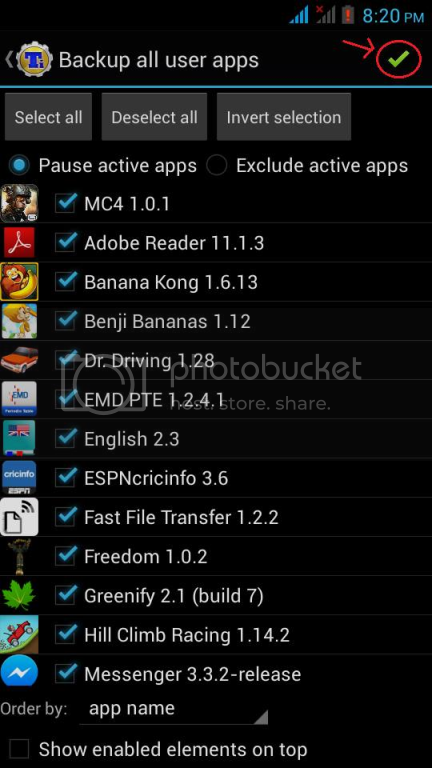 Now if you installed a new ROM and want to restore the apps , then copy the " Titanium Backup " named folder that you copy to the computer to your phone's internal memory " for the ROMs in which the internal memory ( i.e of 12.47 gb ) is default memory ( For Ex. Spice Stock ROM ). And in the ROMs that are having the Sd card as main memory ( For Ex. 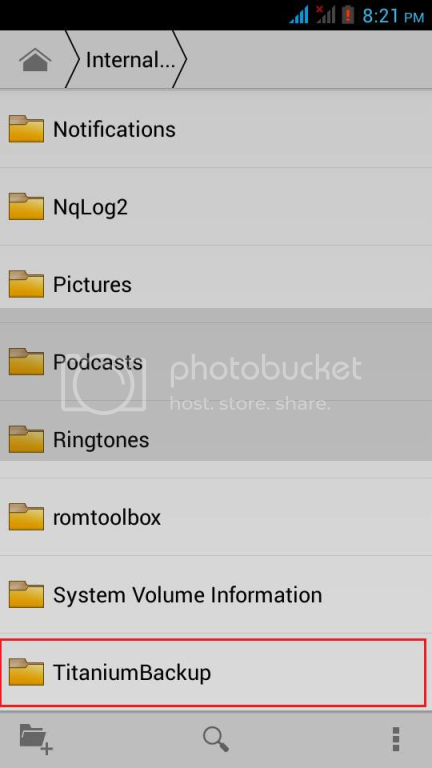 Note 3 , Xperia ROM ) , Copy the " Titanium Backup " named folder in your sd card. Now again open the Titanium Backup app ( not forget this app need root to work ) and again grant permission ( if you have installed a new ROM and installed the app first time ). Now you will again see like this. Select the portion marked in the red colour Circle. Now swipe your finger vertically upwards , You will see like this. Now main thing if you have copied the Titanium Backup folder the that is having the backup of users app then select the portion marked in the red colour circle in the photo. 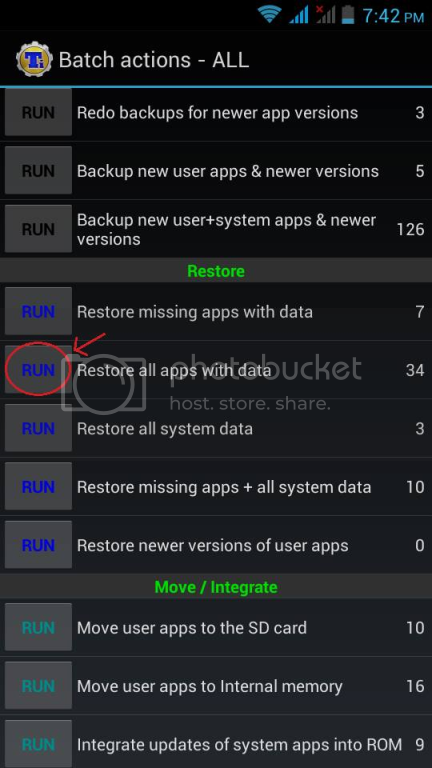 And if you have copied the Titanium Backup folder the that is having the backup of system apps then select the RUN written " Restore all apps with data ". One more ## Important thing I will not recommend you to restore system apps in any other ROM because it can cause issues. ##. Now after selecting the RUN , and checking the apps you want to restore , select the portion that is in the red colour circle in the photo. Now install the app one by one. Select " Done " not " Open " while installing apps. CONGRATS , You have restored all the apps. You can delete the Titanium Backup Folder from the memory where you have copied it if you want. Make sure to copy the " Titanium Backup " folder to the computer after backing up of apps for Future use. Bro i cant do app restore in my Coolpad Note 3. I've done app restore in many other phones but for CN3 it says "Parsing Error". just forgot to mention that if i install that app manually and try to do data restore it does as expected, NO ERRORS. Please help me I want to restore backup of my apps in coolpad note 3...it says error in package...help..
titanium backup is a backup utility for Android that backs up your system and user applications along with their data on external storage of your choice.